MT jumped into national prominence on the basis of this tale about Jim Smiley and his frog, first published in a New York newspaper in November, 1865 and quickly reprinted around the country. Though MT later discounted it as a "villainous backwoods sketch," it already adumbrates motifs that would stick with him throughout his career -- including the use of a vernacular speaker and the unexplained appearance of a mysterious stranger. MT also kept returning to the tale itself, often giving a shortened version of it in his lectures and readings -- including the tour with Cable he arranged to promote Huck Finn. I include it among the sources of Huck Finn, though, essentially for the way it shows MT developing the possibilities of a deadpan narrator. Like Simon Wheeler, Huck tells a tale that is designed to make readers laugh without, as MT puts it below, "without ever smiling." From early on in his career, MT believed that when a humorist gave no sign that he understood the meaning of the story he was telling it made the audience that much more likely to laugh. Of course, in Huck Finn the narrative "innocence" of the storyteller is being put to much more profound thematic uses. MT revised his most famous sketch several times, in modest ways. 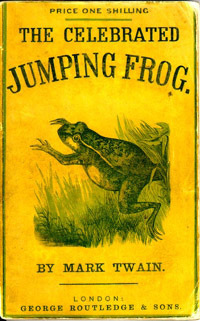 The text below is the 1865 version, which was titled "Jim Smiley and His Jumping Frog." The cover at left is from the first (1867) British publication of the sketch. This rare edition is one of the most recent additions to the Barrett Collection. There was a feller here once by the name of Jim Smiley, in the winter of '49 -- or maybe it was the spring of '50 -- I don't recollect exactly, somehow, though what makes me think it was one or the other is because I remember the big flume wasn't finished when he first came to the camp; but any way, he was the curiosest man about always betting on any thing that turned up you ever see, if he could get any body to bet on the other side, and if he couldn't he'd change sides -- any way that suited the other man would suit him -- any way just so's he got a bet, he was satisfied. But still, he was lucky -- uncommon lucky; he most always come out winner. He was always ready and laying for a chance; there couldn't be no solitry thing mentioned but that feller'd offer to bet on it -- and take any side you please, as I was just telling you. If there was a horse-race, you'd find him flush, or you'd find him busted at the end of it; if there was a dog-fight, he'd bet on it; if there was a cat-fight, he'd bet on it; if there was a chicken-fight, he'd bet on it; why, if there was two birds setting on a fence, he would bet you which one would fly first -- or if there was a camp-meeting, he would be there reglar, to bet on Parson Walker, which he judged to be the best exhorter about here, and so he was, too, and a good man. If he even seen a straddle-bug start to go any wheres, he would bet you how long it would take him to get wherever he was going to, and if you took him up, he would foller that straddle-bug to Mexico but what he would find out where he was bound for and how long he was on the road. Lots of the boys here has seen that Smiley, and can tell you about him. Why, it never made no difference to him -- he would bet on anything -- the dangdest feller. Parson Walker's wife laid very sick, once, for a good while, and it seemed as if they warn't going to save her; but one morning he come in, and Smiley asked him how she was, and he said she was considerable better -- thank the Lord for his inf'nit mercy -- and coming on so smart that, with the blessing of Providence, she'd get well yet -- and Smiley, before he thought, says, "Well, I'll resk two-and-a-half that she don't, anyway."